The Member/Donor Social in January kicks off the year. The Board hosts this event in order to show its appreciation to those in the community who continue to support this small, but deeply historical museum and also to met and create new friendships. Additional projects planned for the museum site include another old school house, a church, a general store and post office, blacksmith shop, tenant hourse and old homestead. Ongoing restoration continues on the current land and buildings. 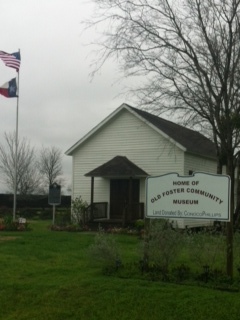 The Old Foster Community is one of the earliest settlements in Fort Bend County having been established by families from Austin's Old 300. Come take a tour of our school and see a piece of history! Around 1920, the school was moved to its present location from its original property south of Jones Creek, on Foster Farms. The 110-year old school has been restored as closely as possible to its original state through the use of old photographs and from the input of former students who still reside in the community. In-kind donations are always welcome! Another exciting year is planned. 2016 proved to be very successful as the Museum had a land plan developed which will earmark all future developements. The Memorial Garden saw groundbreaking in November and the first set of family donated trees were planted. The Member/Donor Social in January kicks off the year along with an Oral History Fair for Foster and the surrounding community. The Museum will host its one "Big Event" fundraiser in August. The theme differs each year, but holds with the Museum's purpose of "Bringing the Past into the Present".